Gillingham boss Steve Lovell felt his side definitely deserved to get something out of their 3-1 defeat to Luton on Saturday. 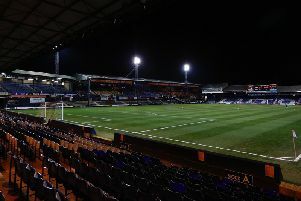 The home chief saw Andrew Shinnie put Luton ahead with an excellent finish on 25 minutes, before Elliot Lee’s close range double in the second period ensured the Hatters triumphed. For most of the game we matched them and there wasn’t a lot in it. Although Tom Eaves pulled one back with 18 minutes to go, Town were never really in danger of conceding again, but speaking to the club’s offical website, Lovell said: “I thought it was a performance that deserved to get something out of the game over the 90 minutes. “The crucial things are goals. “Apart from their three goals, I can’t remember Tomas Holy having to make a save all game. “For most of the game we matched them and there wasn’t a lot in it. “As a coach and a manager you have to take positives out of it, because if you don’t nobody else will. “They kept going right until the end, but it wasn’t to be. “They couldn’t get out. Their bench were shouting at them all second half but they couldn’t get out because of the pressure we were putting them under. Lovell also felt the hosts should have been awarded a penalty for a foul on Elliot List, plus his side could have done much better in stopping Harry Cornick’s stunning run for the Hatters’ third goal. He added: “The fella was nowhere near the ball, he never kicked it. It was either a goal-kick or a penalty but you don’t get them. “The third goal he’s run the whole length of the pitch. “On the halfway line you give a foul away – you pull a shirt or kick him into the stand, but if we score that goal we say what a great goal.